Rotoscoping is becoming more and more fashionable, and while it can be painstakingly slow, the outcomes can be fantastic. What’s more, you don’t even need to be particularly good at drawing! • A video editing suite. 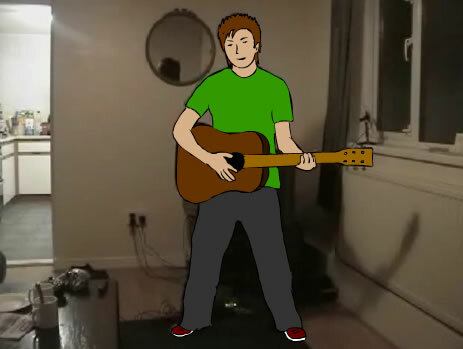 The first thing you need to do is shoot your video. This can be anything you want, but if this is your first attempt at doing anything like this, I would suggest something simple. 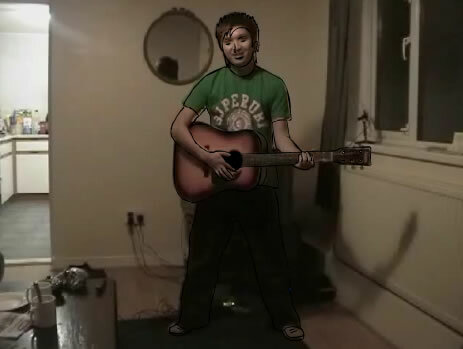 In my example, I’m recording my mate playing a guitar. It’s best to shoot the video with good lighting, and with a plain background so that nothing gets in the way of the character you are trying to trace! Import the video into Flash. Make sure you select “Embed video in SWF and play in the timeline” otherwise you won’t see it on the stage until the movie is published! Once you have your video, place it on the stage. Create a new layer above the layer that the video is on, and fill all of the frames in the top layer with blank keyframes. Also, make sure you set the frame rate of the movie around 12 or 15, as having 25 or 30 would mean you would need to trace an awful lot of frames before you see any real motion! Select the “brush” tool, choose black as the fill colour, and choose a thin brush stroke. Using your tablet, start to trace different parts of the image. I find it easier to concentrate on a certain part of the body for a few frames, so that you get used to doing that kind of stroke. use the “,” and “.” keys to quickly switch between frames. Keep plugging away at it – don’t worry about precise details – from my example I’ve just used a simple line as the eyes, mouth and nose. Eventually, you should have all of the outlines done. Next, choose some bright colours to fill the blanks in! Use the “fill” tool to colour in your figure. You’re done! 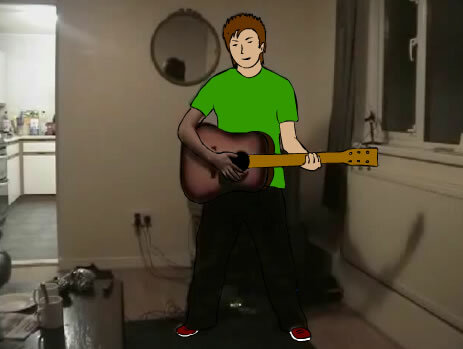 Now all you need to do is hide the layer with the original video on it. Now finish all of the other frames, play the animation and give yourself a pat on the back! Who said animation was difficult?!? !